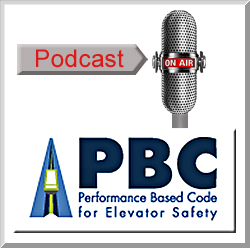 The NEII® podcast provides an educational introduction to the Performance-Based Code (PBC) and presents listeners with a more detailed understanding of the PBC as well as adoption and implementation progress. Ed Donoghue, NEII's managing director, interviews various industry experts about their views of the PBC, providing a clear and comprehensive overview of the code. In Part 1 of the podcast, Jim Coaker, chairman of the ASME A17 Standards Committee and the ASME A17 New Technology Committee and Lou Bialy, director of Worldwide Codes & Standards for Otis Elevator Company, and the chair of the NEII Central Code Committee, discuss the origins and drafting of the PBC. In Part 2, Accredited Elevator/Escalator Certifying Organizations (AECO's) discuss their role in the enforcement and implementation of the PBC. Finally, in Part 3, Jonathan Brooks, former chief inspector for the State of North Carolina, and Dean McLellan, president of NAESAi and an incident management specialist for the Technical Standards and Safety Authority (TSSA) in Ontario, share their thoughts on the importance of the PBC. NEII PBC Podcast Copyrighted © 2010, National Elevator Industry, Inc. National Elevator Industry, Inc. hereby grants a license to any company to reproduce in its entirety this podcast, provided that the reproduction includes the notation that the podcast is copyrighted by National Elevator Industry, Inc. and further provided that the podcast is not altered or modified in any manner. All other rights reserved.